Today at Booklights I’m sharing three of the Cybils Fiction Picture Book finalists. At least one of these will be on the Caldecott list  mark my words. Tomorrow begins Comment Challenge 2010. Look to the FAQs for all the info, and join us in our community venture. This weekend is Bloggiesta, hosted by Maw Books. It’s a chance to spend some time improving your blog, catching up on your reviews, and taming your Google Reader. Next week is National Delurking Week, so plan on coming out of the woodwork and making yourself known. Of course, we’re continuing with Freeze Your Tail Off Month, brought to the United States straight from the Arctic. Lay your bets now that the cold front will be used to dispute global warming. Edited to add the text from Booklights. For the past few months, I've been working as a Cybils panelist to find the best picture books that combine literary value with a kid-friendly appeal. On January 1, 2010 Fiction Picture Book finalists were revealed - along with the finalists from all of the Cybils categories. Looking at the upcoming Caldecott awards, I'm starting my focus on all of the Cybils winners with the ones more likely - in my opinion - also bring home Caldecott silver or gold. The Lion & the Mouse by Jerry Pinkney Gorgeous. Jerry Pinkney has to win the Caldecott for this stunning book. Has to. The wordless book - unless you count the owl sounds and mouse squeaks - allows the reader to fill in the Aesop's fable of the mighty lion who releases a mouse, to find that the tiny creature comes back another day to save him. But by making the story wordless, it removes the arrogance of the lion and the meekness of the mouse, allowing a greater depth of interpretation. This spectacular book breathes new life to an old tale. And I must mention again, gorgeous. 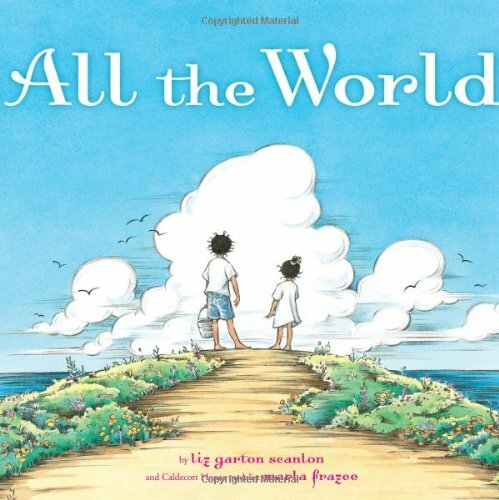 All the World by Liz Garton Scanlon, illustrated by Marla Frazee The Lion & the Mouse is likely to find company on the Caldecott list with this enchanting book. The poetic text is simple, taking a multicultural family through a day that focuses on their connection with each other, with friends and neighbors, and the world around them. The sentiment is lovely and is made more so by the detailed illustrations and breathtaking panoramas. This title encourages repeat readings to expand on the stories contained in the pictures, and the beauty contained in the message. The Curious Garden by Peter Brown Don't rule out this title for the Caldecott list, with it's amazing artwork that takes a dark, smoggy urban area to a green, bright lushness. In the story, Liam discovers a little bit of greenery in a gray, bleak city and decides to care for it. He nurtures the struggling plants into a thriving, growing garden which creeps into the city and transforms the buildings and people. If the book is about the value of nature and the environment, it is also about the possibilities in each of us to affect change for the better. The picture book lady at my almost-local indie children's book store loves that edition of The Lion and the Mouse and wants it to win the Caldecott. I wondered whether a wordless version of a fable that, as best I can tell, not all that many kids are being taught these days really got the full story across, but I have to admit the pictures are gorgeous. I am personally pulling for ALL THE WORLD to win, and have been since I first saw it in all its gorgeousness. (And the words! I love the words, even though they don't factor into the Caldecott list.) I'll have to look for the third book, which I've not yet seen! Love Booklights-I always recommend the site to parents looking to help their children find new books!